The best inventions of the next few years are already in the research and development stage. The following are a sample of those that may well become part of everyday life. There are already a great many apps for mobile phones. But the technology that provides the base for the apps in the first place is developing fast. Future apps may therefore change the way we run our lives by giving us invaluable aids for day-to-day tasks. Every household uses batteries. And a great deal of research money is now going into the development of batteries that are more efficient and last longer. These batteries will appear in electric vehicles, laptops, mobile phones and everyday appliances. Batteries may also supply future backup for other forms of power generation. Inventors are also considering new ways to recharge batteries. Some are looking at how a person’s body heat or movement can charge a mobile phone or MP3 player. Biofuels from edible foodstuffs have created concern about crop availability and prices. Future biofuels are more likely to come from living matter that is unsuitable for human consumption. Such matter includes woodchips and types of grass. Advances in computing will continue at their usual breakneck speed. Already inventors are proposing the use of a new material that has the storage capacity of 250 DVDs but takes up less space than that of a small coin. The days of standard silicon chips are also numbered. Future computer processors will be significantly smaller and more powerful. Inexpensive and instant housing will greatly help areas of the world struggling with widespread slums and natural disasters. Inventors have come up with ideas such as refurbished shipping containers. When converted, the containers provide a full range of housing amenities. There are likely to be many new medical developments in the near future. Among them will be a programmable pill. Doctors will first put medicine in the pill. Then they will programme the pill to apply the medicine to a particular internal part of the human body. Dutch researchers have already tested this idea with success. Another medical advance will be implants. These will test and diagnose patients without the need for regular hospital visits. There are examples of ocean hydropower off the coast of Scotland and in Canada. Turbines floating on the sea’s surface use the energy from waves and currents to create electricity. The technology is young, but interest in it is spreading around the world. Printing in 3D is an old idea. But it’s no longer as expensive as it used to be. This is leading inventors to consider the ways in which they can employ the principles of 3D printing. Scientists, for example, are using 3D printing techniques to rebuild damaged human tissue. There’s nothing new about the idea of an electric car. What will change, though, is the use and availability of such vehicles. 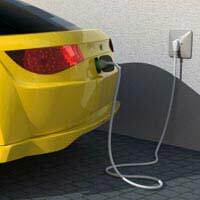 Inventors are proposing a number of ideas that will make electric cars a common reality. These include accessible charging points and battery exchanges. How about a printer-friendly format for these articles? some are worth keeping handy, without having to go back to search for something which may have been taken down.